Munich Helles is a clean, malt-focused German lager with a gentle, bready malt character. It's a smooth, easy-drinking beer that is often consumed by the liter. When the golden and clean lagers of Pilzen became all the rage in the mid-1800's, Munich brewers feared that Germans would start drinking the Czech beer instead of their own. This Helles style is essentially Germany’s answer to meet the demand ("Helles" is German for "bright"). While a bit more malty, it shares the same spicy hop characters of Czech Pils, but at a slightly more subdued level that is more in balance with the malts. 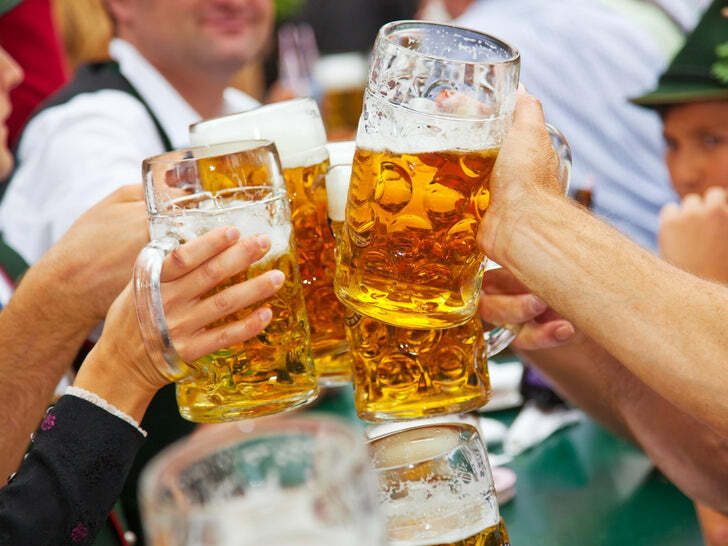 Since the 1970s the most common beer served at Oktoberfest in Germany is not actually an Oktoberfest beer, but Munich Helles. Its lower alcohol level, less malty flavour, and lighter colour makes it more approachable. Brew up a batch and let me know how you like it! Interested in seeing what we're brewing right now? Follow our Instagram feed for pictures and videos of our brewing activities as they happen. Add 500mg potassium metabisulphite to 20 gallons water to remove chlorine/chloramine (as required). (Hit minimums on Ca and Mg, keep the Cl:SO4 ratio low and balanced). For complete details on how to adjust your water, refer to our step by step Water Adjustments guide. 1.5 qt/lb mash thickness. Single infusion mash at 150F for 90 mins. Mashout to 168F. 60-90 min fly sparge with ~5.6-5.8 pH water (measured at mash temperature). Collect 14.9 gallons in boil kettle. Boil for 90 minutes. Lid on at flameout, start chilling immediately. Cool wort to 53F and aerate well. Ferment at 53F until approximately 2-5 points from final gravity, then raise the temperature to 65F and keep it there for 2-4 days to reduce diacetyl (a buttery flavour produced by some yeasts). Rack to CO2 purged brite tank (secondary), crash chill to near freezing (if possible), add 1 tsp of unflavoured gelatin dissolved in a cup of hot distilled water per 5 gallons of beer, and let clear for 2-3 days. Package as you would normally. I keg and carbonate at around 2.5 volumes of C02. The beer will improve greatly if kept near freezing for 1-2 months before serving. I use a lagering/conditioning fridge that holds 6 kegs, set to just above freezing that holds a small 5 pound CO2 tank so that the kegs can condition and carbonate at the same time. You'll need to use 8 packs/vials or make an appropriate starter. For more information see Chapter 6 of How to Brew and Appendix A of Brewing Classic Styles. Also see the stirplate/starter equipment I use. For complete brewing instructions, see our Brew Day: Step by Step guide. Brew yourself a batch today and let us know how you like it! Enjoy! Those girls really can hold a mug of beer. What mug of beer, i don't notice any! I stopped reading at the second picture. What was the recipe again? That picture has been getting mileage on the internet for as long as the internet has existed I think! I'm pretty darn positive a version of it once passed through my 28.8kbps dialup modem! Kal, Just wanted to say that you are a Legend. I'm an Australian brewer of a couple of years doing brew in a bag and building my soon to be commissioned electric kettle using so many ideas from your website. Thankyou. I have tried a few of your recipes and of any recipe I have done, your ones always turn out first time every time and they are superb. I have done two batches of the electric pale ale (beautiful), one IPA, bohemian pilsner and just recently have tried the Munich Helles and it is unbelievable! Thanks for all the help and inspiration. PS, can't wait to eventually see the recipe for the NZ IPA! I'm glad you're enjoying the recipes! The NZ IPA was just brewed yesterday and is now fermenting away... we'll see how it turns out! tineye.com gave more than 800 hits. This recipe is definitely a winner! I brewed 12 gallons and half of it was gone before I was done lagering. I don't make lagers of any sort, nor do I have any cold-temp fermenting capabilities at this point in time. I'm fine with that. But last night a neighbor asked if it's too late to "commission" a brew for her Oktoberfest party on Sep 27th. I can't brew until this Sat 8/23, so there will be exactly 5 weeks from brew day to drinking day. My first inclination would be to go with a tried and true ale recipe (stout, porter or ESB) but I thought I might look at another alternative. To my question - what are your opinions on taking this Munich Helles recipe and using the Wyeast German Ale 1007 yeast? I'd have 2-3 weeks in the fermenter with the remainder of the 5 weeks spent carbonating in the keg. Or barring that idea, any suggestions for a quick 5-week brew-to-drink Oktoberfest ale? 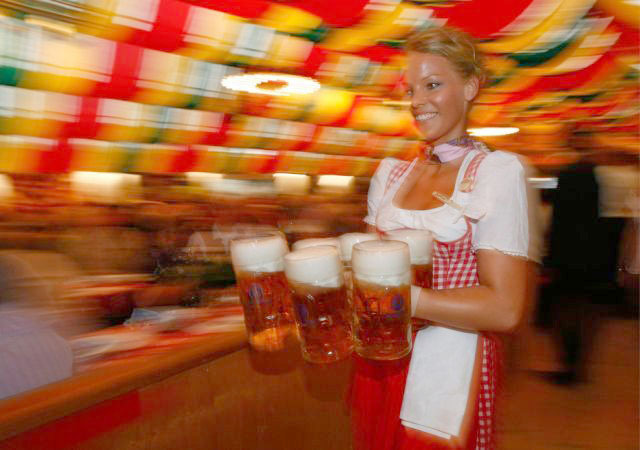 My 2 cents: Don't try and make a Munich Helles or an Oktoberfest using an ale yeast as it won't be what you say it is. I also wouldn't make something you've never made before. Instead, make something you do know you can make well, especially if to give away. Yes I'm generally not too adventurous when it comes to taking a chance on a new recipe that I don't have time to proof myself! Sounds good! Generally speaking I find if you're brewing for a big crowd you want to keep the beer somewhat neutral - nothing too over the top. A Scottish 80/- would work, maybe tone it down a bit to a 70/- or 60/- even. But I do second Kal's suggestion not to try making something new, and not to try warping a traditional style to fit the timeframe. I brewed the Munich Helles and just put it on tap this past weekend and it was a HUGE hit with the non craft beer drinking crowd... very clean. I just brewed this and have been fermenting at 53 degrees in my Morebeer cooled fermentor. My plan is to increase temp now to 65 until fermentation ends. Then I will dump yeast and trub and then add gelatin directly to fermentor and cold crash in it for 4 weeks and then keg and carb. I need to cold crash in the fermentor because I will be out of town and can't keg for 4 weeks. Do you think this will be ok? Any comments would be appreciated this is my first Lager. I just brewed this and have been fermenting at 53 degrees in my Morebeer cooled fermentor. My plan is to increase temp now to 65 until fermentation ends. Then I will dump yeast and trub and then add gelatin directly to fermentor and cold crash in it for 4 weeks and then keg and carb. I need to cold crash in the fermentor because I will be out of town and can't keg for 4 weeks. Do you think this will be ok? Yes - that'll work perfectly well. I am sure that this question has been asked, or I've read it somewhere, but when lagering, do you keep it on the yeast or take it off? Does it matter? I've noticed that the recipes will say, 'preferably lager it for 1-2 months before packaging'. Just wondering why. Technically I believe that lagering is done before packaging as you want it on the yeast to clean up a bit more. I've never done it that way as I don't have an easy way to lager on my yeast. I've been happy with my results in doing it the way I mention in my recipe above, so I've kept doing it. Do a split batch and try both ways and let us know what you think!